Millions of Americans visit amusement parks every year as a source of entertainment for the whole family. Amusement parks are full of thrill rides, games, winding pathways, and other exhibits for people of all ages to enjoy. Unfortunately, these often large and sprawling parks can have many hazardous conditions that may cause injury to patrons. If you expected a day of fun at the amusement park and instead suffered injury, the experienced personal injury lawyers at the office of Flaherty Fardo can help you recover. Amusement park injuries may occur for many various reasons. The type of claim you will bring against the park will depend on the exact circumstances surrounding your injury. For instance, your claim may fall under the legal theory of general negligence, premises liability, products liability, or others. An experienced attorney can analyze the details of your case and determine what type of claim to pursue. Dangerous hazards in walkways or other common areas that cause slip and fall accidents. Safety equipment or another part of a ride malfunctions and causes injury. The ride is designed in a way that it causes whiplash or other injuries to passengers. The park fails to properly warn riders of potential injuries if they have special conditions, such as back issues, heart conditions, pregnancy, and more. Employees act in a negligent manner when helping passengers enter or exit the ride. The park fails to properly inspect and maintain rides, or keep the rides up to federal standards set by the Consumer Products Safety Commission (CPSC). The park does not provide adequate security to keep patrons safe from crimes against their person or property. The nature of your case will depend on the particular type of injury you suffered and the exact cause of that injury. Cases involving amusement park injuries can be challenging for other reasons, as well. Amusement parks are often operated by large corporations, and executives are aware of the high-risk nature of the amusement park business. Therefore, these parks often have legal teams ready to defend claims against them. This is yet another reason why it is imperative for you to seek representation by an experienced personal injury lawyer for your amusement park injury case. Legal claims for amusement park injuries can be very complicated due to the different theories of personal injury law that may apply and the large corporations that often build and operate amusement parks. To make sure you receive the maximum amount of compensation you deserve for your injuries, you should always have an attorney with experience handling this type of case on your side. 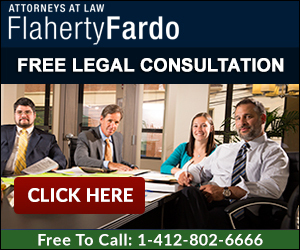 The lawyers at the Pittsburgh office of Flaherty Fardo know how to pursue all types of injury cases and will work zealously to make sure you receive the settlement you deserve. Call our office today at 412-802-6666 to schedule a free legal consultation. Let Us Help You Please explain how the accident / injury occurred?